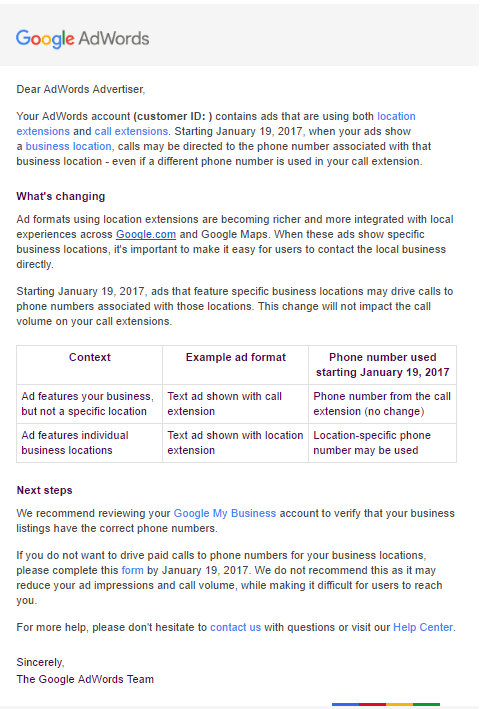 Google My Business Phone Numbers Will Now Show with Location Extensions - Adster Creative Inc.
After an ALL CAPS Skype exchange, it was revealed that Google had taken it upon themselves to make a rather significant update to their Adwords terms, and it damn near snuck right by us. 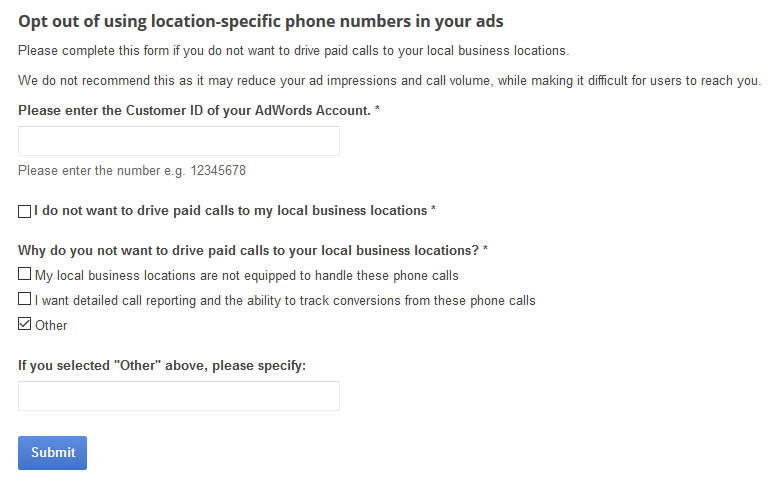 It would seem as though in campaigns that use Location extensions along with Call extensions, the Google My Business phone number (ie: ‘Actual’ phone number) will be the one that displays in your ad, regardless of which number you have selected as a call extension (maybe, more on that below). This is big news for those of us that are fond of consistently tracking things like, oh, say – the effectiveness of marketing campaigns. While Google no doubt has it’s heart in the right place, there are 2 concerns that I find…well…concerning. Suffice to say, learning about such a significant update – from a client no less – is troubling. And, as of today, there appears to be very little information floating around the internet on this subject. Surely we – Featured Google Partner type folk – would be in the know on such matters? And that leads me to concern 2. Mobile and call only campaigns? *So* hot right now. Asked why the email says a location-specific phone number “may be used” instead of “will be used,” a Google spokesperson told Search Engine Land that they are continuously testing. That means it’s possible the ads could potentially show with either number. Everybody got that? Good, ‘cuz I don’t. As much as we don’t wish to lose our precious call data, we surely do NOT want to do anything to an account that may reduce our ad impressions and call volume. “Making it difficult for users to reach you”? I think that speaks for itself. No official announcement from Google on this update. No certainty as to whether location extensions will show the Google My Business number, or the tracker. If we want to keep tracking these calls, we may be reducing our clients ad impressions, call volume, and subsequently make it difficult for their customers to reach them. We’ve got 2 weeks and counting to decide what we want to do with hundreds of campaigns. We’ve fired in an email to our beloved Google rep, and hopefully he is able to shed some light on this sooner than later.